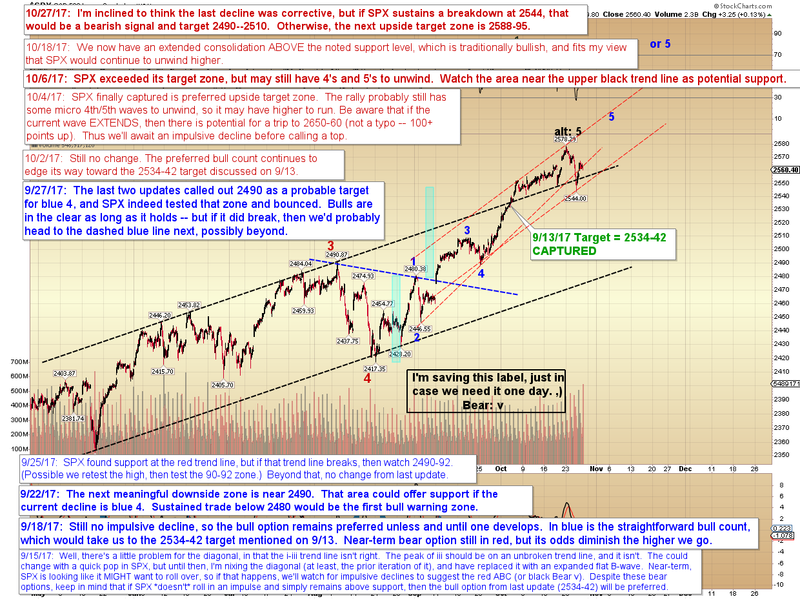 Last update noted that we didn't have enough info yet to declare the rally dead. 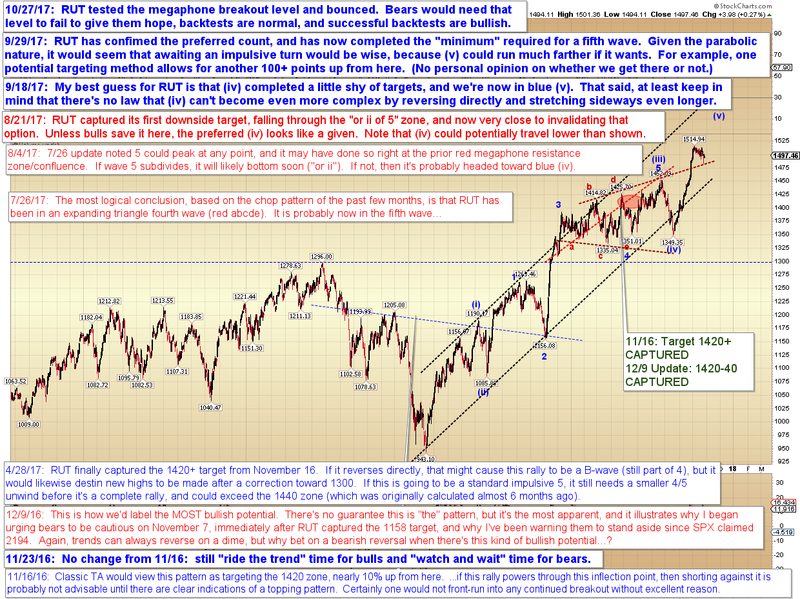 The decline that followed appears to have been corrective in nature, which implies new all-time-highs are on the menu. That said, there is at least a chance that decline was the start of something more bearish -- and in that regard, 2544 is the key level. 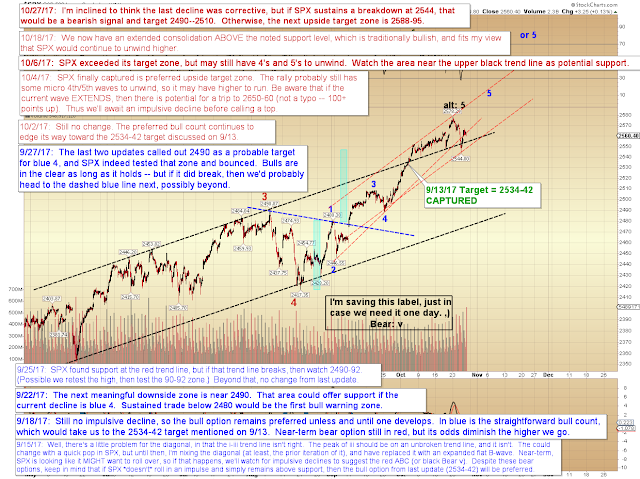 Thus as long as 2544 holds, we'll lean toward favoring the bulls and the prior trend. If it fails, then we'll give more credence to things bearish. I would also note here that in the event 2544 marks the beginning of something bearish, we'll likely have a fairly close retest of the ATH before turning back down, so if one is bearishly inclined, there should be a reasonably low risk entry for bears in the next session or two. One of the charts that has me leaning slightly toward bulls is RUT, which (so far) successfully backtested its recent megaphone breakout. Now, that backtest can always get tested again and fail, which might be bearish were it to occur -- but right now, all we have to go on is what's actually in the charts. In conclusion, we probably still have to presume bulls have the edge here -- but don't get me wrong, I'm not "rabidly bullish" at this juncture, only leaning toward the bulls. This is still an inflection point, so bears could always pull out a surprise upset. The good news is that bears who feel obligated to go short should at least see a decent low-risk entry zone that won't cost them terribly if the bulls are indeed still running the show. Trade safe.